ARLINGTON, Va. – John Fund, the reporter and freelance pro-voter-ID speaker, encouraged the morning audience at Herman Cain’s “Solutions Revolution” to mark April 27-28 on their calendars. On that weekend, the Tea Party spinoff group True the Vote will hold its second annual summit on election fraud – or, at least, the threat of election fraud. The conference will feature some mainstays of the conservative voter integrity circuit. James O’Keefe; former DOJ lawyer/anti-New Black Panther crusader J. Christian Adams; and so on. 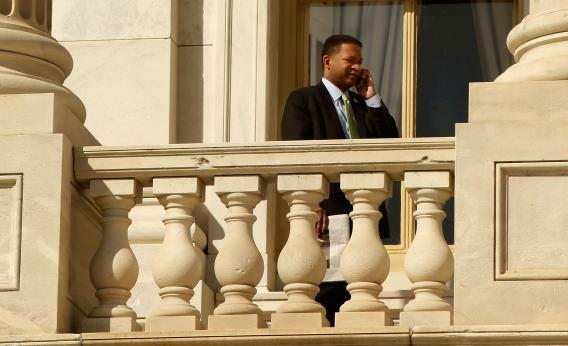 But the star is Artur Davis, the former Democratic congressman from Alabama who has started irritating his old party by ringing bells about voter fraud. Late last year, Davis jawed a little about a possible party switch, but worried that the Alabama GOP had “refused to accept” converts like him. He was being a little humble. The only danger in a Davis switch would come when party leaders sprinted through the same door for the chance to embrace him.